Get useful tips on what kind of college chairs you need to create a positive and productive learning environment. Are ergonomic chairs always a must? Mention school or college chairs and people normally conjure an image of blue or grey bucket shaped plastic chairs which are ubiquitous across the education sector. Because they are cheap and stackable these tend to be the “go to” chairs for all areas; classrooms, workshops, libraries, common areas, staff room and halls. However, each area is unique and has unique needs. Rolling out the same chair in all areas may look like a cost saver up front, but what are the costs in terms of reduced productivity, high staff turnover and lower moral and enthusiasm – in teachers and students? College buildings are the for-bearer of hot-desking and each seat usually sees a number of different occupants each day as students move between classes. This means that college furniture in general is subject to a lot of wear and tear. You can easily rectify this problem by choosing high quality chairs with harder wearing fabrics and materials. For your students to be able to focus well throughout the day it’s an advantage to have college chairs that supports them, make them comfortable and help them move more naturally. In a perfect world all chairs should be height adjustable, backrest adjustable and allow for swivel or non-swivel. Why is classroom design crucial for learning? If the budget doesn’t allow that, it’s good to know that the single most important adjustment on a college chair is the seat height, as it allows the student to have their arms in an ergonomic position, while keeping their feet flat on the floor. There are also alternatives that aren't adjustable, but still have some elements that enables the student to move more naturally while sitting. Another factor that influences the need for an adjustable chair is which type of room the chair is for. In computer labs, where students often sit still for hours, the need for customisation is big, to prevent aching backs, necks and shoulders. 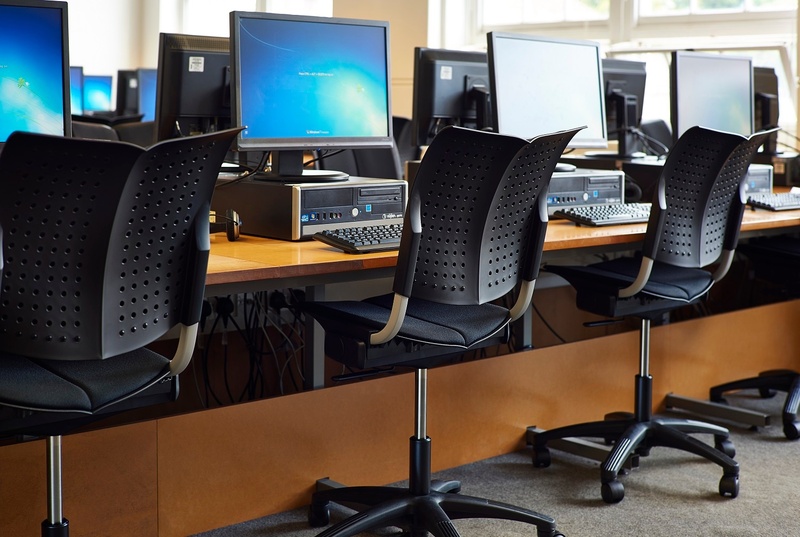 While in a collaboration zone, where students probably move in and out of chairs more frequently, they don’t have the same need of ergonomic seating. In this kind of room soft seating and nice colours could be more important, to make the students relaxed and creative. In “branded zones”, areas that will be seen by visitors and where you want to make a ravishing first impression, style is everything. Here you have the chance to tell the story of your college's brand by using smart, modern, fun and funky furniture. Choose chairs in a unique design. If you are about to invest in new chairs for a classroom and want them to fit to everyone’s needs, another solution is to go for a flexible seating solution. This way you can satisfy everyone’s needs by investing in different types of furniture; sofas, yoga balls, ergonomic chairs, arm chairs, standing desks or even a yoga mat. Switching position could reduce the health risks of sitting, and you will also save money not having to invest in active sitting chairs for all students. Flexible seating also seems to increase the discipline of students and make them more relaxed and “at home”.